An interview with AKAR Foundation, with psychological insight on cultural roots and identity by Denny Putra. Raising children in this internet and digital information era is no easy task no matter where we live; external influences (good and bad) already exist within homes through gadgets and cable TV. So it is a great importance for parent(s) to equip their children with values, knowledge, experiences and perspectives. With these “tools” they will inherit the “wilderness” of this world and lead their lives into the future. By comprehending the wilderness, hopefully the future will be all about exciting opportunities to the children. The term “wilderness”, according to Sacred Bridge Foundation, is anything we encounter as soon after our birth, and it exists in several domains from physical, psychological, geographical, social to cultural. A physical comfort or discomfort in hospital and/or home is one example of wilderness that an infant immediately experiences at birth, while the geographical area expands from home, neighborhood, school, public space, recreational venue, work place to countries. The level of care at home given by parent(s) is the psychological part of wilderness that a child faces; negligence, too much attention, child abuse, and good parenting are among the examples that may describe the range of wilderness in this domain. The social layer also stretches as the child grows up, from immediate family members, relatives, neighbors, school friends, communities to colleagues at work. The cultural part involves roots and identity that cover family history, race, ethnicity, faith or religion, migration and naturalization, profession, and so on. The following interview focuses on the cultural part of wilderness among the Indonesian diaspora in the US, particularly a few individuals who live and/or were born in New York City. The interview involves Andhini Febrina and Bhima Aryateja, the two founders of AKAR (meaning roots in Indonesian), and three of its immediate supporters, Garry Poluan, Annissa Hamaki, and Arya Handoko. 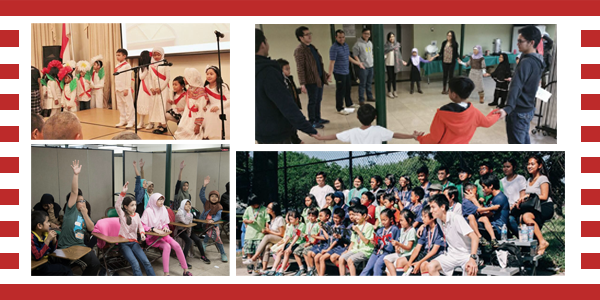 AKAR is a not-for-profit organization that aims is to reintroduce Indonesian cultural heritage to Indonesian children who were born in the US by using Indonesian language as the main vehicle. In doing so, AKAR naturally must deal with variety of challenges; finding and securing an ideal venue for conducting the program, minor parental support, and a handful of volunteers are some of the difficulties that the organization have to resolve. In addition to the interview, we feature a brief but appealing view by Denny Putra, a senior teaching faculty at the Department of Psychology, Universitas Kristen Jakarta (Christian University at Jakarta). His writing is about cultural identity with regards to wilderness that we mentioned earlier. Listen to the World: How did AKAR start? Akar: We first thought about the program around July 2014 when PERMIAS (Indonesian Students Association in USA) held Indonesian Independence Day games in New York City. The participants of the games were Indonesian children born and raised in the USA. Quite many of them weren’t able to speak Indonesian. Moreover, they had no clue about the history and culture either. This condition sparked Andhini Febrina and Bhima Aryateja to do something about it by establishing AKAR as the first step. The three of us then immediately pledged our support. Our objective is to encourage and assist the children to rediscover Indonesian culture through the teaching of Indonesian language. Do all AKAR’s committee members come from Jakarta? Most of them do, but some volunteers come from different cities in Java. What are the backgrounds of the committee members? All of us are students studying different majors, such as economics, communication, education, journalistic, arts, etc. What is your concern regarding the program’s condition today? What’s quite apprehensive now is the lack of volunteers. Although the parents and students’ enthusiasm rises, the number of volunteering teachers is decreasing. Is there any assistance from the government and Indonesian embassy? 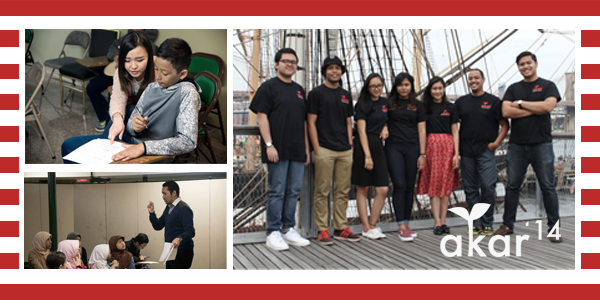 In 2015, we received financial assistance from the Indonesian Embassy in Washington DC while the General Consulate in New York City provided us with a venue to run our program and event. How many children have participated in this program? To this day, there are approximately 50 students in total that have joined the tutoring program, including those who no longer participate due to clashing schedule. Is there any memorable experience during the program? Thank God the program has been running well. The most rewarding moment is every time we see the students try their best to communicate with the tutors in Indonesian. Do you have any plan to expand the program to the other states? We have disseminated the information about our program and the learning materials to members of PERMIAS, Persatuan Mahasiswa Indonesia di Amerika Serikat (Indonesian Student Association in the United States), across the states, in case they are interested in having this program in their state. Up to this day, none has started anything yet. Why did you choose mosque as a place where Akar’s first sessions were held? What is the purpose? We chose it because there were many Indonesian children taking Islamic studies in the mosque. The purpose was to gather prospective participants efficiently. Do you have any plan to hold the sessions in other mosques or other communities? At first, we had an intention to start the program in other places, including church, but the idea brought controversies among some members of the mosque management board at the time. Just a few months ago, we tried again in Indonesian church community. It was still a trial session and there were only a few students. It was difficult to arrange the schedule since the number of teachers we have is quite limited. Do you accept non-Moslem students? Yes. AKAR welcomes all Indonesians in New York although the mosque management board asks us to prioritize the Moslem student; when there’s still room left we will accommodate children of any faith. What approach do you use to make the children understand the logic of Indonesian language? We use visual aids to introduce objects and terms in most sessions. Do the children show curiosity about Indonesia? Some children show more interest and enthusiasm than the others. How do they see the logic in the language? Does it make things harder or easier for them? At first, the children were confused in adapting to the logic of Indonesian language. However, as it is practiced during the class and at home listening to their parents talking in Indonesian, the confusion gradually disappears—it only occurs when new topics are introduced. How do the children see their identity? We see the majority of the children (ranging from 7 to 11 years old) haven’t identified themselves as Indonesians. As we’ve mentioned above, compared to other children from various descents, the Indonesian children here haven’t really used their mother language (Indonesian) that much when it comes to daily conversation with their parents and fellow Indonesian friends. From our observation, we think the children feel themselves more as American than Indonesian. Do they have the confidence to be Indonesian in New York? So far, we see that they’re neutral. There is no extreme pride or shame in being Indonesian that affects their living in New York. How does the New York environment shape them? We see New York as a melting pot—the heterogeneous society consists of different races, religions, nations, and backgrounds; it shapes them to be more tolerant children who respect differences, compared to the majority of children their age living in Indonesia. On the other hand, however, they don’t really show their pride in being Indonesian. Do the children see Indonesia – as a multicultural country – as potential or strength? They haven’t been able to see it yet. What are the obstacles for Indonesians living in New York? There’s a bit of bad habit in discriminating race and religion, and that limits their ability to see that diversity is what makes the culture rich. Other than that, there’s the lack of pride in being Indonesian that holds back the parents in teaching their children their should-be-native language. How do you see the “English is cool, Indonesian is not” phenomena among the young Indonesian? This problem doesn’t just appear all of a sudden. It’s something progressing for decades, caused by technology and Westernization. Therefore, it is very crucial to make the children proud and interested in our own culture and our own language. What values do you teach to the children to make them appreciate Indonesian language? We tell them that it will add their skills and will make communication easier for them when they’re in Indonesia. How do you attract the children in learning Indonesian language? 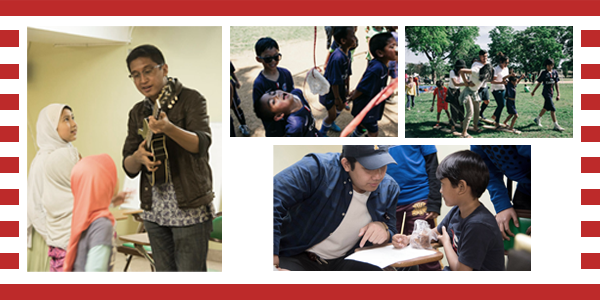 We use local games and Indonesian children music for children aged 5 to 9 years old, and exercises combined with games for children aged 10 to 14 years old. How does AKAR view the emerging issues on Islamophobia, anti immigrant, terrorism, and white supremacy? We are very concerned, but we feel grateful living in New York because it’s one of the most multicultural and tolerant cities. The government is also actively involved in assisting the immigrants. How do the Indonesian children feel? We have faith that they’re confident and they feel secure. Do the immigrant communities interact to each other? Does the Indonesian multicultural value have a role in the way the children think? The majority of children (aged 7 to 11 years old) still haven’t been able to see Indonesian diverse culture as something that matters in their life. Advanced technology today has made things easier for us in terms of communication, access to information, and education. However, if not controlled, it can bring bad impacts to human civilization. What is the role of (information) technology in AKAR’s activities? It is not that significant actually; we teach language, we mostly talk and write in classes without any gadget. We occasionally use video whenever we feel it’s more appropriate for the topics to be discussed. Which one is more efficient to teach children: gadget or books? We prefer books since each child’s access to gadget is different, while every child can always grab a book, read, and write. Our program consists of 10 meetings followed by 2 days of evaluation test and 1 day full of traditional games, songs, and dances from all over Indonesia. Besides AKAR, we also did a short interview with two children and their parents. Rangga Faber was accompanied by his father Chandra Faber, and Suzan Koch was with her mother Citra Bakti. For Rangga and Suzan, learning Indonesian language is a load of fun, and both not only want to be able to speak Indonesian, but also to read and write. They also feel that they need to have an adequate fluency in the language so that they can communicate with other Indonesians in the city, and with their relatives back home. Visiting their home country also seems to be something they look forward to. So far, learning Indonesian language is considerably easy to them. For Rangga, one of his favorite words is “bermain” (play in English) since he loves to play with friends; for Suzan, her favorite word is “terima kasih” (thank you in English) because it is easy to say, it sounds good, and it’s meaningful. Another important matter that they shared with us was the fact that they simply love the tutors for being very kind and patient. As parents, Chandra and Citra are grateful to AKAR for teaching their children Indonesian language and occasionally sharing subjects that are part of Indonesian cultural heritage. To them, able to speak, read, and write in Indonesian is a must. They don’t want their children to forget or neglect their cultural roots. They hope that through learning the language, their children will also learn about Indonesian values, customs, and traditions; they feel that their children need to be equipped with these subjects since they grow up and live in a free society. Their future hope for AKAR includes program continuity, more tutoring hours, and government support for the program. Identity crisis may not occur mainly during adolescence but adolescents are often found to experience greater anxiety than other age groups, due to their progressing hormonal changes and widening social encounters, in their journey of discovering, developing, and at some point affirming both of their self and social identity. Developmental psychology recognizes four statuses (identity confusion, foreclosure, moratorium, and achievement) on how adolescents exploring and evaluating their stands over many life domains including embracing cultural identity. Their current behaviors may serve as observable indicators that reflect on where they are on this identity development. Some are careless and make very little commitment to understand their “roots” while others made premature commitment to his roots without even trying to explore further due to their given family heritage. One of the four statuses (identity moratorium) seems to serve as possibly the closest term to the main principle of what Sacred Bridge describe as wilderness, that is an interesting and exciting active exploration period that leads to self growth albeit potential risk involved. A moment of walking down the path by encountering variety of stimulus, possibilities and opportunities that supposedly help build one’s courage and spirit along the way to learn, evaluate and decide on how one lives one’s live. Understanding adolescents’ journey in this wilderness to embrace their roots requires efforts to listen to their inner struggle on how they perceived and being perceived by their social environment on who they are supposed to be and how they are supposed to act. The tug of war between equally strong force of wanting to be unique (ideal) against wanting to belong (real) acts as subconscious driving force of adolescents’ attitude toward wilderness. A stimulus such as learning one’s native language can swing back and forth from being viewed by adolescents as an opportunity at one end to the threat to themselves at the other end due to their inner conflict of unique vs “belongingness”. Achieving balance or harmony of this inner conflict should be the aim of those who wants to help these youth to embrace and proud of their cultural roots. How do we reintroduce them to their unique cultural identity and at the same time provide a gradual feeling of acceptance and pride of their collective identity. Denny Putra is a senior lecturer at the Department of Psychology of Universitas Kristen Jakarta (Christian University at Jakarta), and Psychology Specialist at Sacred Bridge Foundation. Denny Putra obtained his Master Degree in Psychology from Loyola University in Chicago, Illinois, USA. It is interesting to me when this article mentioned about mosque involvement in Akar’s program. It reminds me an era when Muhammad (a prophet of Islam) used mosque as public facility and opened for any kind of faith. Unfortunately, regarding mosque roles in Akar’s program, the management seems feel insecure due to conservative view in which plurality is often be avoided. Mosque should embrace every kind of faith for the sake of humankind. Yeah. A public facility in which people could learn together, is to share and discusses ideas. Inspiring! We need this kind of initiatives here also, in Indonesia (especially that is initiated by the young). Considering we are struggling with identity crisis.